James M. Nelson and Margaret E. Nelson opened the Nelson Funeral Home at 205 Highland Avenue, Vine Grove, Kentucky. They had their first funeral service July 7, 1948. C. Alex Edelen purchased interest in the funeral home in 1949 which then became known as the Nelson-Edelen Funeral Home. In 1959, the funeral home became known as the Nelson-Edelen-Bennett Funeral Home when Margaret and Owen Bennett Jr., purchased the Nelson's portion of the business. They purchased the rest of the business in 1977 and remained the sole owners until 1996. Due to illness and impending death of Owen Bennett, his daughter and son-in-law, Beth and Larry Calvert became partners. Larry left his portion of the business to Beth upon his death in 2015. Their daughter and son-in-law are following in the business and joined the staff in 2012. 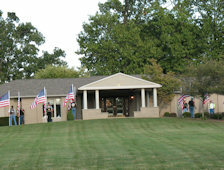 The funeral home in Vine Grove, still at its original address, continues to be the office and a fully operational facility. In 1971, Nelson-Edelen-Bennett Funeral Home at 2072 S. Dixie Boulevard, Radcliff, Kentucky was opened. It is conveniently located less than 5 miles from Kentucky Veterans Cemetery Central and less than 2 miles from North Hardin Memorial Gardens. Nelson-Edelen-Bennet Funeral Home has a long history of serving the families of Hardin County. We continue to be family owned and always strive to provide compassionate care to the families we serve. We invite you to visit our staff page to learn a little more about who we are.